Not to be confused with methimazole or methazolamide. None assigned; no evidence of teratogenicity in animal studies, but use in the third trimester may cause adverse effects in the newborn or ductus arteriosus (a heart defect) due to its weak NSAID activity. Metamizole (Methyl, Amino und Pyrazol, INN), or dipyrone (BAN, USAN), is an ampyrone sulfonate analgesic (pain reliever), antispasmodic (spasm reliever) and antipyretic (fever reducer). Like paracetamol, it has minimal anti-inflammatory effects. It is most commonly given orally or parenterally (by injection) to prevent and treat pain related to surgery or for the treatment of acute pain. It was first introduced into clinical use in Germany in 1922 under the brandname "Novalgin" and for many years it was available over-the-counter in most countries, until its toxicities became apparent. Although it is still available over-the-counter in some countries, it is now a prescription drug in most developed countries, due to its potential for adverse events, including agranulocytosis. Metamizole is marketed under various trade names. Its use in pregnancy is advised against, although animal studies are reassuring in that they show minimal risk of birth defects; its use in the elderly or those with liver/kidney impairment is advised against, but if these groups of people must be treated a lower dose and caution is usually advised; its use in lactation is advised against as it is excreted in breast milk. Metamizole has a potential of haematologic (blood-related) toxicity (blood dyscrasias), but causes less kidney, cardiovascular, and GI toxicity than non-steroidal anti-inflammatory drugs (NSAIDs). Like NSAIDs, it can trigger bronchospasm or anaphylaxis, especially in those with asthma. Serious side effects include agranulocytosis, aplastic anaemia, hypersensitivity reactions (like anaphylaxis and bronchospasm), toxic epidermal necrolysis and it may provoke acute attacks of porphyria, as it is chemically related to the sulfonamides. The relative risk for agranulocytosis appears to greatly vary according to the country of estimates on said rate and opinion on the risk is strongly divided. Previous hypersensitivity (such as agranulocytosis or anaphylaxis) to metamizole or any of the excipients (e.g. lactose) in the preparation used, acute porphyria, impaired haematopoiesis (such as due to treatment with chemotherapy agents), third trimester of pregnancy (potential for adverse effects in the newborn), lactation, children with a body weight below 16 kg, history of aspirin-induced asthma and other hypersensitivity reactions to analgesics. Ciclosporin Decreased serum levels of ciclosporin. Chlorpromazine Additive hypothermia (low body temperature) may result. Methotrexate Additive risk for haematologic (blood) toxicity. Oral anticoagulants (blood thinners), lithium, captopril, triamterene and antihypertensives may also interact with metamizole, as other pyrazolones are known to interact adversely with these substances. It is considered fairly safe on overdose, but in these cases supportive measures are usually advised as well as measures to limit absorption (such as activated charcoal) and accelerate excretion (such as haemodialysis). Its precise mechanism of action is unknown, although it is believed that inhibiting brain and spinal cord prostaglandin (fat-like molecules that are involved in inflammation, pain and fever) synthesis might be involved. Recently, researchers uncovered another potential mechanism involving metamizole being a prodrug. In this proposal, not yet verified by other researchers, the metamizole itself breaks down into other chemicals that are the actual active agents. The result is a couple of cannabinoid and NSAID arachidonic acid conjugates (although not in the strict chemical meaning of the word) of metamizole's breakdown products. Despite this studies in animals have found that the first cannabinoid receptor is not involved in the analgesia induced by metamizole. Although it seems to inhibit fevers caused by prostaglandins, especially prostaglandin E2. It appears to produce its therapeutic effects by means of its metabolites, especially N-methyl-4-aminoantipyrine (MAA) and 4-aminoantipyrine (AA). Ludwig Knorr was a student of Emil Fischer who won the Nobel Prize for his work on purines and sugars, which included the discovery of phenylhydrazine. In the 1880s, Knorr was trying to make quinolone derivatives from phenylhydrazine, and instead made a pyrazole derivative, which after a methylation, he made into phenazone, also called antipyrine, which has been called "the 'mother' of all modern antipyretic analgesics. ":26–27 Sales of that drug exploded, and in the 1890s chemists at Teerfarbenfabrik Meister, Lucius & Co. (a precursor of Hoechst AG which is now Sanofi), made another derivative called pyramidon which was three times more active than antipyrine. 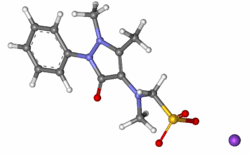 In 1893, a derivative of antipyrine, aminopyrine, was made by Friedrich Stolz at Hoechst. :26–27 Yet later, chemists at Hoechst made a derivative, melubrine (sodium antipyrine aminomethanesulfonate), which was introduced in 1913, and yet later metamizole was synthesized; metamizole is a methyl derivative of melubrine and is also a more soluble prodrug of pyramidon. :26–27 Metamizole was first marketed in Germany as "Novalgin" in 1922. Metamizole's legal status by country as of April 2014 Grey: No data; likely over-the-counter if the country is not developed, otherwise likely banned. Light blue: over-the-counter with limited restrictions. Blue: Prescription-only, with fairly limited restrictions on its use. Orange: Prescription-only, with extensive restrictions on its use. Red: complete ban. Metamizole is banned in several countries, available by prescription in others (sometimes with strong warnings, sometimes without), and available over the counter in yet others. For example, approval was withdrawn in Sweden (1974), the USA (1977), and India (2013). Metamizole is generic, and in countries where it is marketed, it is available under many brand names. 1 2 3 4 5 6 Brune, K (1997). "The early history of non-opioid analgesics". Acute Pain. 1: 33. doi:10.1016/S1366-0071(97)80033-2. 1 2 3 4 5 Brayfield, A, ed. (13 December 2013). "Dipyrone". Martindale: The Complete Drug Reference. Pharmaceutical Press. Retrieved 19 April 2014. 1 2 3 4 5 6 7 8 9 10 11 "Fachinformation (Zusammenfassung der Merkmale des Arzneimittels) Novaminsulfon injekt 1000 mg Lichtenstein Novaminsulfon injekt 2500 mg Lichtenstein". Winthrop Arzneimittel GmbH (in German). Zinteva Pharm GmbH. February 2013. Retrieved 19 April 2014. 1 2 3 4 5 6 7 Jage, J; Laufenberg-Feldmann, R; Heid, F (20 March 2008). "Medikamente zur postoperativen Schmerztherapie: Bewährtes und Neues" [Drugs for postoperative analgesia: routine and new aspects. Part 1: non-opioids]. Der Anaesthesist (in German). 57 (4): 382–390. doi:10.1007/s00101-008-1326-x. PMID 18351305. 1 2 3 United Nations Department of Economic and Social Affairs (2005). Consolidated List of Products Whose Consumption and/or Sale Have Been Banned, Withdrawn, Severely Restricted of Not Approved by Governments (PDF) (12th ed.). New York: United Nations. pp. 171–5. Retrieved 3 April 2013. 1 2 3 4 Brack, A; Rittner, HL; Schäfer, M (March 2004). "Nichtopioidanalgetika zur perioperativen Schmerztherapie" [Non-opioid analgesics for perioperative pain therapy. Risks and rational basis for use]. Der Anaesthesist (in German). 53 (3): 263–80. doi:10.1007/s00101-003-0641-5. PMID 15021958. ↑ Council of Europe; Council of Europe. European Directorate for the Quality of Medicines & HealthCare (EDQM); Rada Europy; European Pharmacopoeia Commission; European Directorate for the Quality of Medicines & Healthcare (2013). European Pharmacopoeia: Published in Accordance with the Convention on the Elaboration of a European Pharmacopoeia (European Treaty Series No. 50). Council of Europe. ISBN 978-92-871-7527-4. ↑ Jasiecka, A; Maślanka, T; Jaroszewski, JJ (2014). "Pharmacological characteristics of metamizole". Polish Journal of Veterinary Sciences. 17 (1): 207–14. doi:10.2478/pjvs-2014-0030. PMID 24724493. ↑ Elmas, P; Ulugol, A (November 2013). "Involvement of cannabinoid CB1 receptors in the antinociceptive effect of dipyrone". Journal of Neural Transmission. 120 (11): 1533–8. doi:10.1007/s00702-013-1052-7. PMID 23784345. ↑ Malvar, DD; Aguiar, FA; Vaz, AD; Assis, DC; de Melo, MC; Jabor, VA; Kalapothakis,, E; Ferreira, SH; Clososki, GC; de Souza, GE (April 2014). "The dipyrone metabolite 4-MAA induces hypothermia and inhibits PGE2-dependent and -independent fever while 4-AA only blocks PGE2 -dependent fever". British Journal of Pharmacology. 171 (15): 3666–79. doi:10.1111/bph.12717. PMID 24712707. ↑ Rogosch, T; Sinning, C; Podlewski, A; Watzer, B; Schlosburg, J; Lichtman, AH; Cascio, MG; Bisogno, T; Di Marzo, V; Nüsing, R; Imming, P (January 2012). "Novel bioactive metabolites of dipyrone (metamizol)" (PDF). Bioorganic & Medicinal Chemistry. 20 (1): 101–7. doi:10.1016/j.bmc.2011.11.028. PMC 3248997 . PMID 22172309. ↑ Bhaumik, S (5 July 2013). "India's health ministry bans pioglitazone, metamizole, and flupentixol-melitracen.". BMJ (Clinical research ed.). 347: f4366. doi:10.1136/bmj.f4366. PMID 23833116.